Our TerraCycle US office in Trenton is a little unusual – most of our furniture, decorations, flooring, and even our courtyard is made from garbage! People are always fascinated when they hear this, so we wanted to give you a little sneak peek into the TerraCycle office. Check out the photos below! 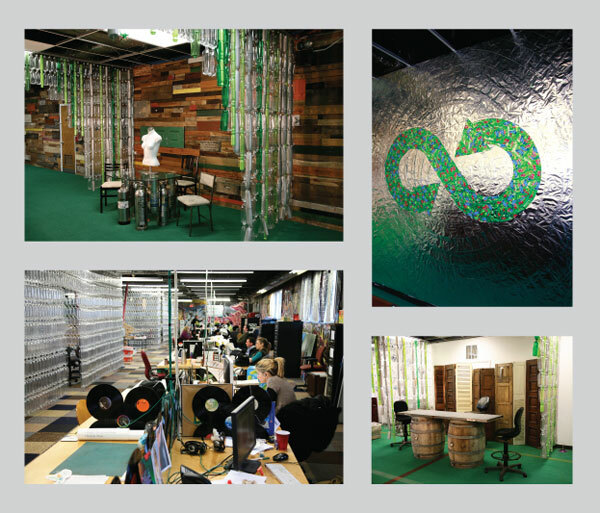 Design-office: The entrance to our offices and the main room here at TerraCycle! The walls in the office lobby are made from juice pouches (top right) as well as wood pieces and drawers (top left) and old doors (bottom right). The desks in the main room are old doors, and the dividers are made of old records (bottom left). You can also see that some walls are made from soda bottles. New Office Left side: Pallets serve as desk legs in the new office, and some walls are made out of old records. The carpeting is left over carpet squares from carpet samples and manufacturing. Walls are decorated with graffiti art.